Micro-dermabrasion achieves irresistible and stunning results in achieving smooth skin texture and softness with his most sought-after service. This advanced skin resurfacing treatment breaks apart dead cell layers and aging spots. It eliminates signs of sun damage.. Treat Acne – Scars Scarring. Safe For All The Skin Types. Pain-Free – No Recovery Time. 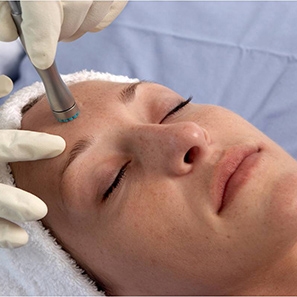 Microdermabrasion is a technique for removing the topmost layer of the skin, leaving soft and healthy .the hand wand removes this layer of skin by polishing it with aluminum oxide crystals and vacuuming the dead cells in a controlled manner.Removing the dead skin leaves a smoother skin surface and promotes the growth of healthy skin cells is the best choice for skin resurfacing.